The monsters surrounding them crowded together tightly, and although they could see the outer edge of the enclosing horde, breaking through was clearly impossible. Five Level 30 players could consider charging out through an enclosure of several hundreds of monsters, but they didn’t even bother to think about it, with their 6.6 on average Leveled group. “Feng Xiong… they’re still closing in on us…” Long Aomin reminded the pensive Feng Bujue. “Fine, but I’d rather not die right before the ending. If they really blitz over here, we should still retreat into the Gate.” Long Aomin insisted. Feng Bujue nodded, he then just sat cross-legged where he stood and carefully analyzed the two keys in his hand; the slowly encroaching demon army wasn’t pressuring him at all. He propped his elbows on his legs, lowered his head, and lightly tapped his forehead with two fingers. Several seconds later he slowly raised his head and traced his fingertips slowly down his nose. During this entire time, his eyes had constantly been wandering until they finally landed on the hazy moon in the sky. His eyes suddenly brightened as something flashed through his mind. “Do you remember what the premise of the plot was when we first entered the Scenario?” Feng Bujue asked aloud. Feng Bujue recalled while he spoke, “The second spoken segment was… ‘until one night, the sun setted and never rose again. A hazy moonlight, appearing and disappearing behind drifting black clouds, shone on this deathly still and lonely city.’” He spoke the lines verbatim. Feng Bujue spoke, “The rules behind this Scenario… the so-called cycle and that darkness… I understand them now.” He said, “If we take time in this Scenario and view it as a straight line, with the ends of the line undefined, then this ‘line’ has neither a beginning nor an end. “I’m not talking about Geometry, I was just using shapes to demonstrate this concept.” Feng Bujue still nonchalantly explained. “Feng Xiong… no, Jue bro! You don’t have to explain to us, really, it’s fine if only you understand these things by yourself. Just tell us if there’s another way besides retreating into the Gate!” Just like this, Long Aomin, became a person who called Feng Bujue his older bro… even though he was four years older than Feng Bujue. “Actually, restoring the seal doesn’t require any sort of special action,” Feng Bujue spoke as he raised the two keys he still held in his hand, in the same way as he had before. “Hey! Aren’t we just waiting in vain then!” shouted Wang Tanzhi. The monsters kept coming closer and closer and there were only twenty meters left separating them from the team. “What escape! You’re just holding up Keys, that’s all!” Lonely Lil’ Bro shouted as well. “I’m saying Jue Bro… right now…” Long Aomin was about to say something. A flash from the Keys interrupted him. A bright ray of light burst toward the skies. Even the heavily restrained night air seemed to have lightened quite a bit. The two Keys circled each other as they flew into the air and inserted themselves into the missing parts of the main array on the Gate. Divine rays shone; the Fire and Wood arrays were restored and the Pentagram once again emerged as the Gate slowly began to close. “What… what happened?” Long Aomin had already lifted his shield, ready to meet the attack. He never expected this kind of reversal to happen in such a short period of time. Lil’ Tan, Lonely and Lonesome completely mentally short-circuited. In their moments of despair earlier, the surrounding pressure combined with Feng Bujue’s calm aggravated them somewhat, but they were completely speechless right now. This silence was something to be expected as the sort of exaltation which comes from wresting back their life would need some time before it could manifest itself. “In 115 minutes, bring the Keys to the front of the Gate and the seal will restore itself. That’s all,” said Feng BuJue. “As for the monsters, it’s very simple. The system had arranged for the enclosure to happen at the last moment to test whether we’d be pushed into retreating into the Gate. The monster slowly surrounded us on purpose only to make the desperate moment seem direr and the seal’s activation more dramatic. At this moment, the System Notification sound really did go off, but the unexpected thing was it wasn’t finished with its dialogue. These words directly appeared in all five persons’ minds. Startlingly, the voice that interrupted the System’s dialog and was currently speaking was that distinctive whisper which had come from the third darkness. Feng Bujue astutely opened and checked the menu. Although the System didn’t finish its dialog, the “Restore the Seal” mission in the mission log displayed a check and was already completed. Underneath, another new mission had been added: 【Survive Samodeer’s attack】. “Seen the new mission yet?” Feng Bujue’s tone was as if nothing big was going on. “Don’t tell me that punk is corporeal?” said Wang Tanzhi. “According to my speculation, Samodeer doesn’t have a body. Or maybe it’s better said, based on the setting (of the Scenario), his body exists in a higher dimension. If he wants to appear before us, he needs to embody some form that our dimension can comprehend.” replied Feng Bujue, “Just like how ‘Galactus’ appears as a wretched purple-wearing middle-aged man, if Samodeer wants to personally deal with us, he’ll first have to create a corporeal form. Only then will he be able to injure us in the physical plane (of existence). “Speak in Human…” Wang Tanzahi retorted. “See, just like that…” said Feng Bujue as he raised one hand to point at some place. The black clouds had already dispersed, and the moonlight covered the pavement with a layer of silvery frost. Everyone turned their gaze in the direction he pointed, only to see on the ground a dense, circular shadow amidst the moon bathed stone. Just like a black abyss, that five-meter shadow drew in even light. Means brother but usually reserved for polite respect. Like it said earlier Xiong was more polite, but Long Aomin is now calling Feng Bujue by his name, not his surname, and even calling him older brother. This is to show how desperate he is and even willing to defer senority to him just to escape this situation. Sorry, I don’t know if is a issue of translation or not, but the part on the calculus of the time ceiling they had at their disposal to clear the stage doesn’t make any sense to me. May you explain it? It’s based off of a clock. If you look at an analog clock face you start at 6 then go 15 minutes from 6 to 9. Then you go from 9 to 1 which is 20 minutes and so on so forth. It doesn’t make sense if you don’t use a clock face, so if you’re still confused just go look at a clock face and count the minutes from where the minute hand would be on 6 then to 9 then to 1 then to 8 then to 6. Keep going clockwise. Hope that helps. Disclaimer: I apologise for the use of possible inaccurate words, but I’m not a mother tongue and I have no experience in talking about clocks in English, lol. Yupe, know it’s clear. The issue was not that I didn’t have present an analogue clock face (I make use an analogue watch), but that I’m too used to use it. 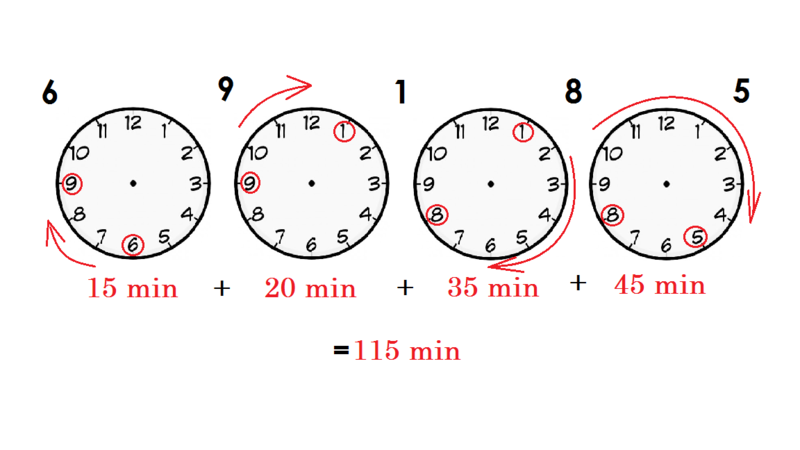 Since he was talking about minutes, I was considering the minute notches, 1-60 for a clock turn, out of habit and not the hour’s, 1-12 for a clock turn, since they usually are not named so when talking about minutes. Thanks a lot for the answer and maybe you could make it a bit clearer in the text for other like me; sometimes habits can limit understanding of things when used in a different manner from how one is accustomed.